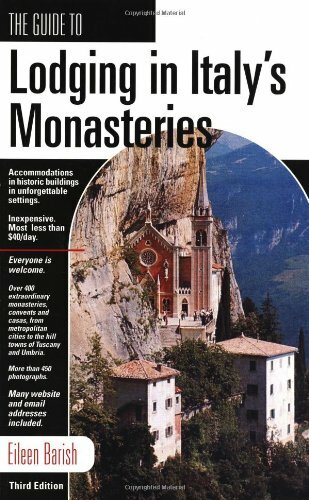 There are many monasteries and convents in Rome and it isn’t necessary to have a particular faith to enjoy their benefits. The Convent of S. Emilia de Vialar is very attractive because it has a spectacular view from the terrace of the Dome of St Peter’s Basilica. But gazing at Michaelangelo’s great architectural achievement is just one of the pleasures of a stay here. This magnificent guest house is run by the Sisters of St Joseph of the Apparition and is located at Via Paolo III not far from the Vatican walls. It is about a fifteen minute walk down to the Vatican itself or there is a bus stop just a short walk from the Convent which takes the visitor down to the Vatican and then on to the centre of Rome. There are 21 single or double rooms with ensuite, and eight single rooms with shared bathrooms. Rooms are simply furnished - my single room had a bed, night table, cupboard, desk and chair. They have high ceilings, are light and airy and centrally heated in the winter months. At other times there is a pull-cord facility for extra heating or air conditioning. Note that not all rooms overlook St Peter's. All rooms have a washbasin with towels and soap provided. Every day the rooms are cleaned and the bedding is changed every three days. The corridors are wide and spacious, flanked on either side with comfortable chairs, elegant pieces of furniture and paintings on the walls. On the first floor there is a room with a television. It is beautifully furnished with soft chairs and antique furniture. There is also a conference room for meetings as well as a computer room with a small fee for use. Vending machines can be found in the corridor where you can purchase basic snacks and drinks. On the second floor there is a quiet, relaxing area, again with television, and a small kitchen to make hot drinks, heat up food in a microwave and a table to sit at. This is where to find hairdryers and an iron and ironing board. One of the delights of S. Emilia de Vialar is the fourth floor where French doors lead out onto the roof. 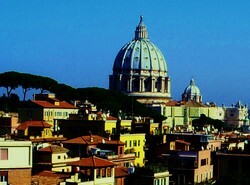 From here there are spectacular, panoramic views of Rome. Breakfast, which is included in the nightly price, is a simple but plentiful buffet which is served on the ground floor between 7:00am and 9:00am. The coffee is wonderful. However, unless you are going to walk down the hill and eat in restaurants near the Vatican, the best option for a lunchtime or evening meal is directly opposite the Convent, over the very busy road (cross at the zebra crossing) in the neighbouring guest house monastery. If you show a business card from the Convent you will get a concession for an excellent three course meal at just 16 euros, including all the wine you can drink. This is a refectory-type situation, so there is no menu – but the food is traditional, well presented, different each day, and there's lots of it. If you would like to attend Mass there is a beautiful chapel on the first floor, where you will be very welcome. 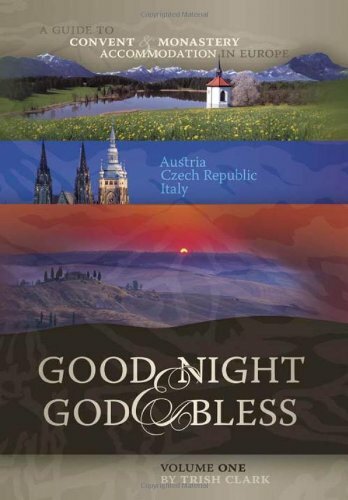 You may even hear the nuns singing in the morning at 7:00 am – a lovely way to start the day. On weekdays Lauds is at 7:00 am, Mass at 7.15 am, Vespers is at 5.30 pm. The peaceful gardens of S. Emilia de Vialar are full of pine, palm and citrus fruit trees. There is a little pond with goldfish which the local cats love to stare into. The terrace has tables and chairs from where you can gaze across at St Peter’s – at night it looks particularly stunning. The massive pine trees drop their giant cones in the autumn, and the smell of their essence tinges the warm air. Nailed to their trunks are the Stations of the Cross, small brass plaques that modestly merge with their natural surroundings. In the night you may hear the underground trains, or traffic sounds drifting up from Rome below – but gradually these sounds of the city fade and all that is left is the wind sighing in the pines outside your window. There are two important factors to remember about the Convent S. Emilia de Vialar. There is a curfew - you must be inside the convent by 11:00pm (11.30 from June to September) so bear this in mind if you are keen on clubbing. 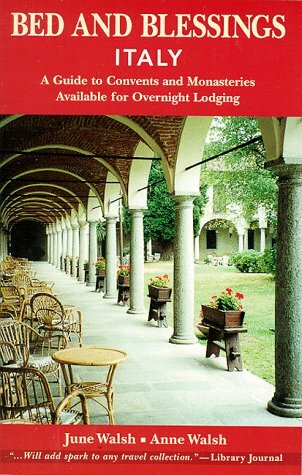 The Convent of S. Emilia de Vialar has an unguarded parking area nearby. Check in is from 8:00am – 9:00pm. Bedrooms can be occupied from 1:00pm and must be left by 10:00am on the day of departure. S. Emilia de Vialar welcomes people with 'certain disabilities' – it might be best to contact them to find out what they mean by ‘certain’, but there are lifts to all floors and everywhere is wide enough for wheelchair access. This beautiful Convent welcomes families with young children, individuals and adult groups. Many of the nuns speak English and are extremely kind and helpful. The Convent does not have a website at the time of writing. Rome is an expensive city, but the Convent of S. Emilia de Vialar is a very reasonable alternative to the usual hotel accommodation. 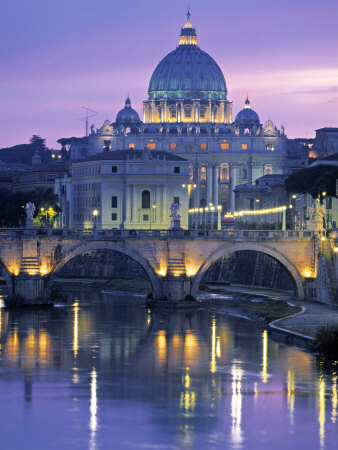 It offers a welcoming atmosphere, as well as peace and serenity after a busy day in the Eternal City. Was Oscar Wilde a Catholic? Opinions differ as to whether Victorian writer, Oscar Wilde, converted to Catholicism on his deathbed.